This topic might sound a little depressing, but often finding food really is a matter of survival, especially outside the main city centres. Once while staying a way out of the centre of Sapporo (skiing) I was very hungry and knew that I needed a good hit of calories for my last day on the slopes the next day, and in desperation I bought a block of tofu from a convenience store (no sauces I could find) and ate it raw, standing over my hotel room sink. This is about as bad as it gets, but often in Japan food comes down to simply getting enough calories, and desperate times can call for desperate measures. Japan is a fascinating and rewarding country to live, so I wouldn't suggest letting food put one off coming (to visit or to live), however it's strongly advisable to live in one of the major cities (unless one is content to cook at home and almost never eat out with friends/colleagues). Life on the go in Japan recently because easier since the introduction of macrobiotic snacks at many convenience stores, especially Lawsons. I like the chocolate brownie the most, and it's also the most commonly available, and is even sold at some small convenience stores inside train stations. The whole range of these macrobiotic cookies are all vegan. If these aren't available then 7-Elevens and other stores sell vegan soymilk, which can be added to black coffee to make a latte of sorts. The plain rice onigiri are just rice, so are fine, and edamame (cooked soybeans) are just soybeans fried in light oil. 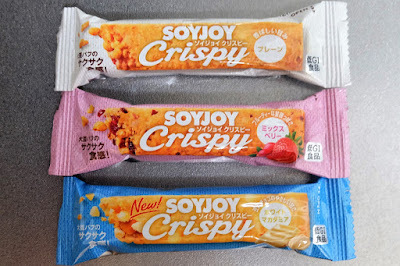 Soyjoy Crispy bars are vegan, however the regular (not crispy) ones contain egg. Only the Crispy Series are vegan. There are many sites and posts about food available in convenience stores, as it's often the only option for food. I recently found This site on vegan products in Japan which is far more comprehensive than what I have here (and is written by people with better Japanese skills). However, products in convenience stores come and go quickly and ingredients change, and I'm yet to find a website detailing vegan products which is kept reliable and up to date, and I'm not going to attempt myself either. As good as it usually gets from a konbini (convenience store): a black coffee, soymilk (mix for a latte), a plain rice ball and edamame (soybeans). Rice balls (like onigiri, but just plan rice) are usually vegan, having only rice and sushi vinegar. Sometimes vegan onigiri (triangular rice pockets) come and go, but most contain fish derivatives or unknown amino acids (which may be derived from fish). Edamame (triangular packet above) are just whole soybeans (in their pods) cooked in vegetable oil. Black coffee is of course vegan, and the soymilk shown above is vegan, and can be mixed to make a latte. You'll find better at Starbucks, but this is as good as it usually gets in the inaka (countryside). Sometimes using Google Translate helps to read ingredients on food products, but very few ready-to-eat packaged foods in Japan are vegan, especially from convenience stores. It usually brings up ambiguous ingredients (eg amino acid - see below) but it's worth a try, especially for products which have few ingredients. Most products aren't vegan, even if they seem like they 'should be'. In short, unless you can read the ingredients (yourself, or with Google Translator or similar) never assume something is vegan. Bags of nuts are often ok, but many come with fish (no joke, but they're usually shown in pictures) and I recently found that a packet of peanuts were cooked in butter oil!?! As noted below, breads from convenience stores always contain dairy and/or egg. These Inari Sushi are safely vegan, because they're from Taiwan. But most in Japan probably aren't, despite popular belief to the contrary. Some contain meat and most contain stocks or suspect amino acids. Many websites claim that inari sushi (pita pockets) are usually vegan. They are sometimes, but many also contain stocks which may or may not be animal-derived, including an unknown amino acid which is used in most takeout meals foods in Japan. Most convenience stores sell bags of nuts, but watch out for small fish in them (I'm not joking). Seom also contain butter oil (shown below), however some "butter peanuts" are actually made only with vegetable oil. Never Be Too Careful: It didn't occur to me to check the ingredients of these peanuts, which are cooked in butter oil (バターオイル) and even have a red warning that they contain dairy products. Tofu is usually vegan, but it can be made with nigari (にがり, traditional, vegan) or glycerine (グリセリン), which may be animal-derived. Chips (French Fries) known as Fried Potatoes in Japan are sold all over the country, including in many convenience stores. Most ones for sale in supermarkets don't contain any animal ingredients (generally just potato and a cheap oil) and, according to their allergen charts, 7-11 ones do not contain beef, chicken, pork, fish, dairy or egg, so are probably vegan? At other restaurants there are always concerns over what seasonings may be used (and it's never possible to really find out) but they are a possibility. Most kaiten sushi (conveyor belt places) have a few vegan options, including kapamaki (cucumber), pickle, gourd and another purplish vegetable with a very distinctive flavour (name in English and Japanese to come). These sushi places can be found all over Japan. It's difficult to explain what you don't eat though, and chefs will rarely speak English. Check for dashi (fish flakes). Stack your plates up neatly. They are colour-coded, and at the end a staff member will count the plates to determine your bill. Since the vegetable dishes are generally considered 'snacks' a vegan meal at these places can be very cheap. 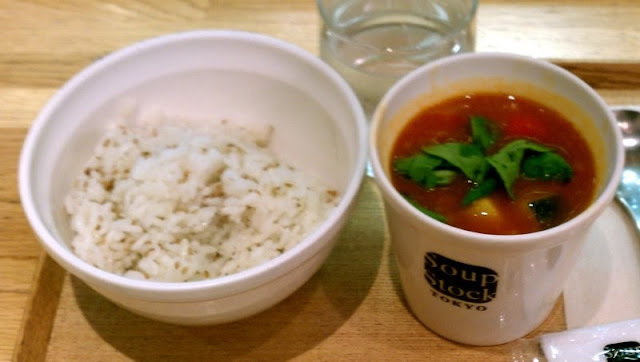 Soup Stock Tokyo are the only chain store I know of which are worth visiting (unless truly desperate). Their menu is continually changing, but usually includes at least one vegan soup. All restaurants have lists of ingredients (in Japanese, and sometimes in English) for the soups, and so long as they are not too busy staff are generally willing to read/translate the list and find a vegan one. They only prepare a few of the (also changing) menu on any given day, but if they aren't too busy, staff are sometimes willing to cook up the vegetarian one if they don't have it served. Soup Stock Tokyo are usually a good bet for a quick vegan meal. I once was fortunate enough to be able to see the ingredients of their bread rolls, and they were vegan, but it's unlikely other breads are, so if possible ask to see the ingredients first. Chabuton are a chain ramen restaurant, which offer two vegan dishes: ramen and gyoza (dumplings). 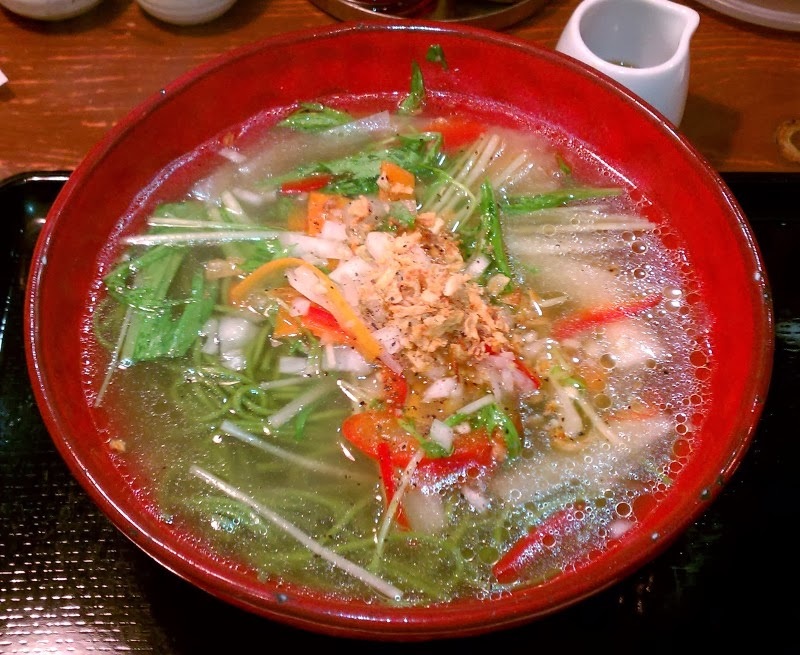 The ramen aren't bad at all, and it's good to show demand for a vegan dish, but of course it's no substitute for T's Tantan, the all-vegan ramen and curry restaurant in Tokyo Station. While the staff should know how to cook the ramen by the ("100% vegetable") recipe, don't expect them to know or understand anything about veganism (or most likely speak much English) so assume that any condiments supplied aren't vegan. There are many chain stores such as Jonathons which serve simple Japanese-style food. Most will serve chips (fried potato, which may or may not be vegan) and white rice, and an all-you-can-drink (non-alcoholic) "drinks bar". Jonathon's also serve baked potatoes, so it's possible to order one without the butter or meat filling. These places may be a last resort at times, but that's all they should be. For a long time I ate at subway restaurants, assuming that the bread followed international recipes. I have since learned though that the breads all contain dairy products. Also, another 'surprise' many years ago was that the red wine vinegarette contains microscopic pieces of bacon (yes, really) and the 'chilli-tomato' sauce also contains meat. So an 'oil-vinegar-salt-pepper' salad might be ok, but my suggestion is to stay away from Subway restaurants. 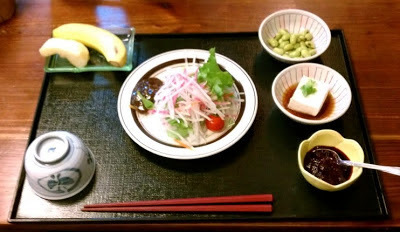 Japan has many restaurants dedicated to tofu, and these are often the first suggestions to vegans looking for food (especially by foreigners). However, these are actually the worst restaurants to go to, as the stocks used (virtually) all contain fish products. It's taken me two years to really come to understand this, but the concept of eating cooked food two or three times, or even once per day is purely a cultural habit. We just need calories for energy (though some findings are questioning even that, such as this study on Nepal's Buddha Boy, but that's another story). There's really no reason not to be able to eat nuts, fresh and dried fruits etc for a few days. They can be easily carried around, or bought from supermarkets and convenience stores. I'm finding it easier and easier, but still find I really need hot meals after skiing, perhaps because of the cold and the energy burned during hours on the slopes. But even then it's becomming easier and easier to not eat cooked food. Buy a loaf of bread from an organic shop (or order it online) and carry it with you (see below that most bread isn't vegan). Beware that many bakeries label allergens (including milk and egg) but may not include lard, so be sure to ask or buy imported bread from an organic shop with ingredients labelled in English (or German, as many breads here are). It will last anything from a few days (summer) to a week or longer (Hokkaido in winter!). Hotel breakfasts (which usually only have white rice, salad and fresh or tinned fruit) often have a toaster oven and breads, so it's possible to carry in a few slices in a ziplock bag and cook it in the oven yourself, which helps as it gets older. They often even have jam to eat it with. A few slices of toast with jam goes a long way if you need to wait for cafes to open for lunch. As I say, this post is about survival. There's little to warn about safety-wise in Tokyo (except banging your head on things if you're over six foot) but there are a few vegan traps. The first and generally well-known one is the fish-sauce, which leaves requires little explanation except to say that most chefs won't think about, or won't think their products contain it even if they do (miso soup is a common example). The other well-known one is 'dashi' - fish flakes which can be sprinkled over otherwise-vegan foods, such as sushi. The owner/cook at this traditional pension took great care to prepare me a vegan breakfast. Unfortunately, she inadvertently added dashi flakes to the soy sauce with the tofu (not visible in this photo). It's not the first time I've encountered them in specially-prepared meals. Less well known are that in Japan (like Taiwan), virtually all breads, including those sold at convenience stores, contains milk and/or egg products. There are a few exceptions, generally specialty European bakeries (which will sell you the most expensive bread you'll buy in your life) and a few supermarkets, which often label whether their breads contain milk or egg products (for people with allergies). This (to my recent unpleasant surprise) apparently includes the bread at subway restaurants (above). Also, Soyafarm soy yoghurts fooled me for two years. They should be a great product: they're dairy free with real live culture, which I used to make my own soy yoghurt. But now I know why my yoghurt never turned out quite like the starter: they contain gelatine!?!? I thought dashi is stock/broth (fish dashi / konbu dashi etc). Fish flakes are called katsuobushi, aren't they? 鰹節 (bonito flakes). Yes that's correct. Dashi is usually (by default) from fish, and most Japanese won't think of it as being not vegetarian, even experienced chefs. Yes I think that's correct about katsuobushi. But really anything which could contain either of these probably does, so is probably not vegan. 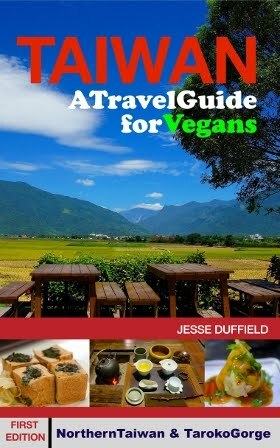 My husband and I are both Vegan and will be travelling to Japan next week. This is our second trip and I found this blog SO useful, thank you so much!! You're most welcome! I'm trying to keep it up to date. Please let me know if I can help with anything. I hope you had a good time in Japan! Hello. Thanks for the comment. I'm trying to keep my website up-to-date, and as far as I can tell this page is. 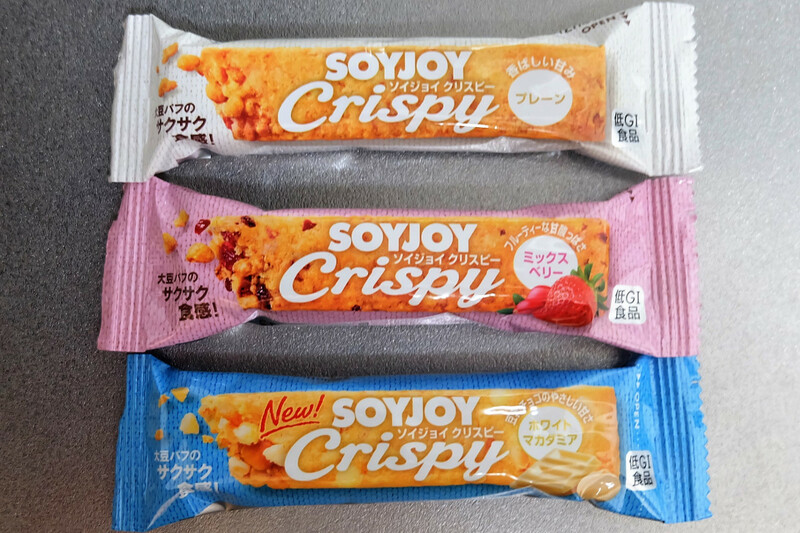 There is now another flavour of the macrobiotic cookies out, and a new "plain" Soyjoy bar which is vegan, so I'll add these soon. Please feel free to email me and let me know if I can help with anything. Tokyo and especially Kyoto are your best options for vegans by far, so it sounds like you have should find plenty of food and not need these items anyway - hopefully!